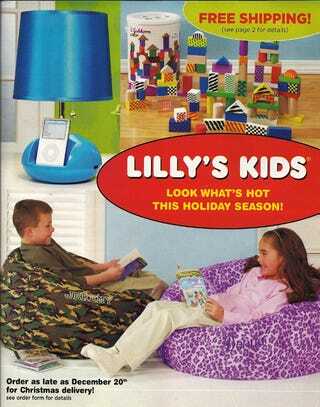 There are many lessons to be learned in the Lilly's Kids Holiday catalog, with stuff for kids ages 2 and up! For instance: Some toys/jobs are for girls, while other toys/jobs are for boys. Car repair? That's for boys. That look on his face says: "I'm thinking about overcharging you." Cooking and cleaning? That's for girls. The young lady on the left might also be discovering that a frying pan can double as a weapon, but that's for advanced users. Grilling? That's for boys. Even though cooking on a stove is for girls, if you cook with fire, you're following our ancestor, Homo Erectus. Early Man, not Early Woman! Playing with your food is something both girls and boys can do; although only girls work at McDonald's. Related: When I was four, I loved McDonald's intensely and thought it was a burger and shake heaven on earth. So when a teacher asked me — the only black kid in my pre-k class — what I wanted to do when I grew up, I said "work at McDonald's." My mom witnessed this interaction and, I think, almost died of disappointment. Being a pretty princess, wearing make-up and jewelry? That's for girls. And just because you're a princess doesn't mean you shouldn't bake, make toast or blend a smoothie. Duh. That's what girls do. A plush pet condo, for girls ages 2 and up. Because it's never too early to be a crazy cat lady! Something all girls look forward to: Graduating from a baking princess to a Queen Of Clean. Maybe someday she'll be in one of those sad mop commercials Sarah Haskins is always making fun of. Don't tell Danica Patrick, but car racing is for boys. Falling in love is for girls. Except soccer. Girls can play soccer. And whatever that other thing is. OMG progress: Girls can be doctors! Or star in primetime medical dramas! But boys can be paleontologists, truckers, law enforcement officials or doctors.